Do you want to outfit your Cat® machine with the finest Cat parts the market has to offer? If so, count on Michigan CAT to supply you with what you need. We stock a wide range of Cat Classic parts — the parts that are optimized for use in older Cat machines. 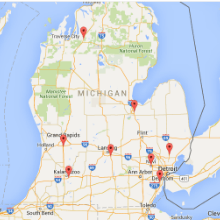 With several locations throughout the state of Michigan, drop boxes conveniently located near you and the ability to order parts online, ordering Cat Classic parts has never been easier. Read on to learn why ordering Cat Classic parts through Michigan CAT is a smart choice. Cat Classic’s parts line consists of over 2,700 items for 150+ kinds of Cat machines. Cat Classic parts carry our standard parts warranty. You’ll have access to Michigan CAT’s expert service and support technicians. We offer competitive, budget-friendly prices for our Cat Classic parts. Ready to Invest in a Cat Classic Part? If you prefer, you can complete the form on this page and one of our friendly, knowledgeable sales representatives will contact you as soon as possible.